I realize this is almost not even a recipe as it is so easy! 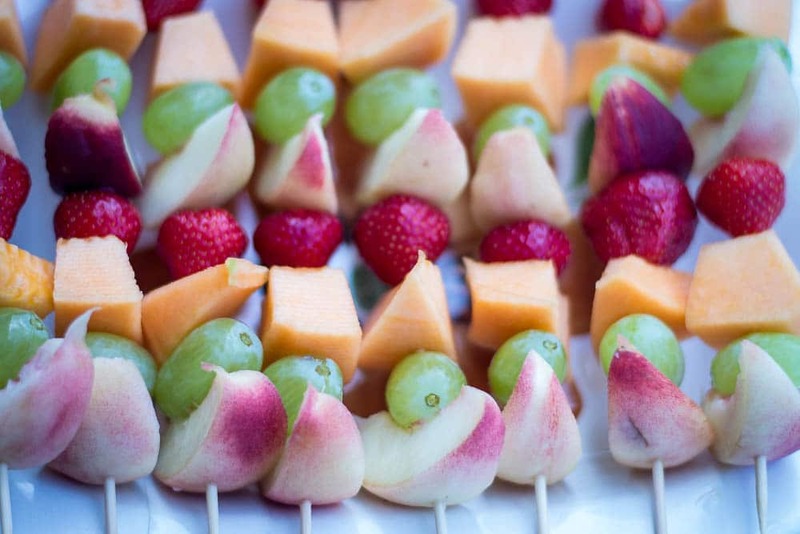 I’m posting it anyway because these are the days for Christmas parties and the hazelnut and dark chocolate fruit kebabs are so elegant, tempting and guiltless that you are sure to impress, whether you are hosting the party or you are invited and you want to bring something different to add to the feast. I made them in Imperia (where we go to the seaside in Italy) this summer. The first time it was a beach birthday party in the late evening. Marina, the party girl, was turning 11 and she is (like the rest of her family) so dear to all of us! We know each other since she was 1 year old. Her mum Nicoletta was bringing the majority of the party food to the beach helped by her other 3 amazing daughters. I knew the other guests would have brought something as well and although asked to rest and not do anything I couldn’t go bare hands! 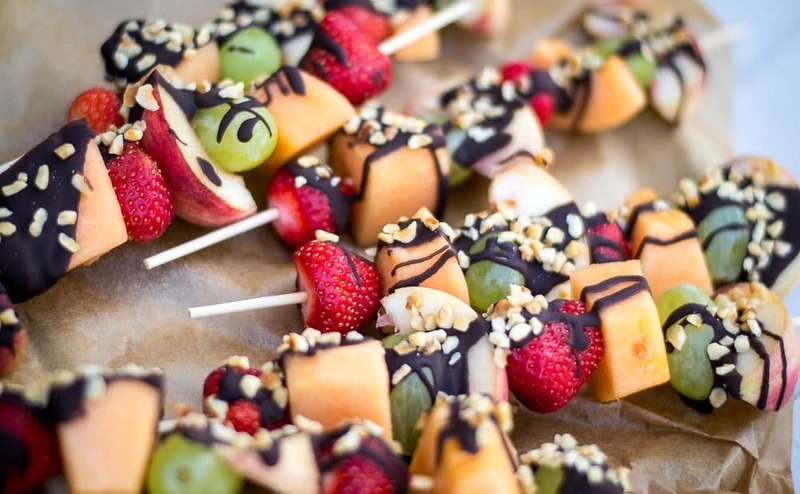 Fruit kebabs are perfect as they are, but with a drizzle of melted dark chocolate they become something that also a kid hardly refuses. This time it was a beach picnic, again at sunset. We were meeting with a few couples of dear friends who live in the area, two of them – Marco and Chiara – are great and expert vegan cooks and like always they brought a lot of delicious stuff. 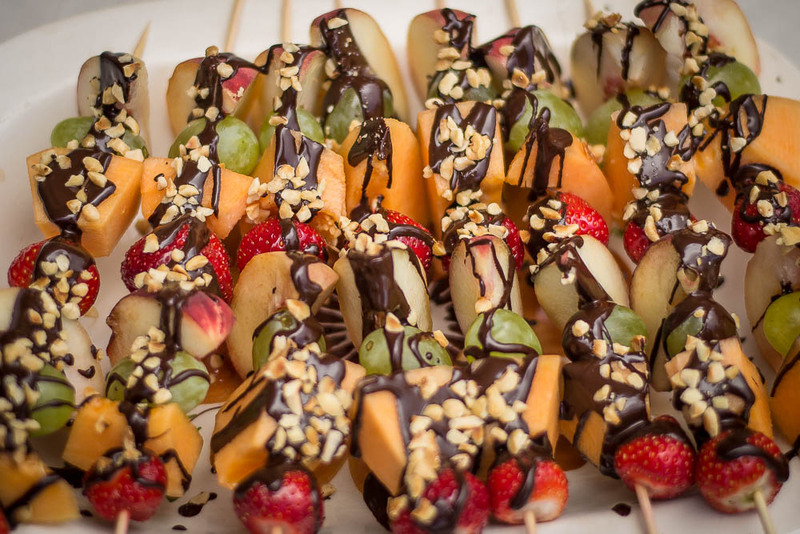 My contribution were these hazelnut and dark chocolate fruit kebabs, I brought the fruit but not the usual fruit! 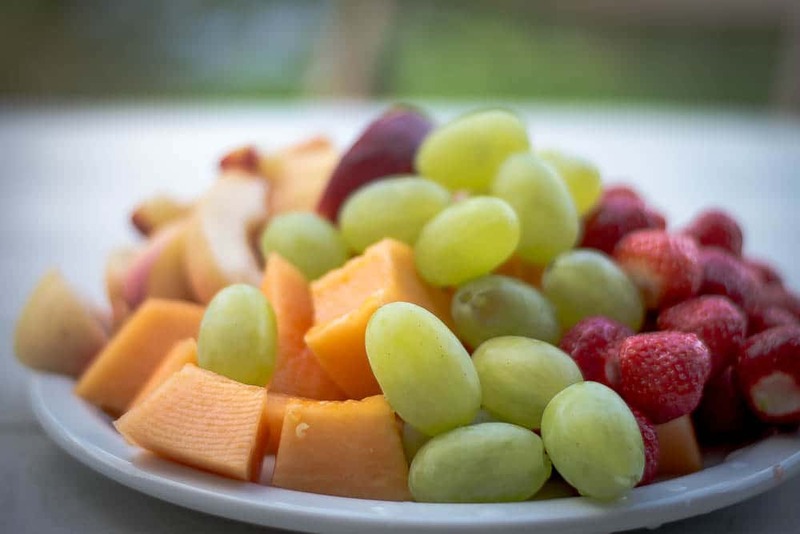 Wash and chop the fruit and if you can divide it in separate bowls. 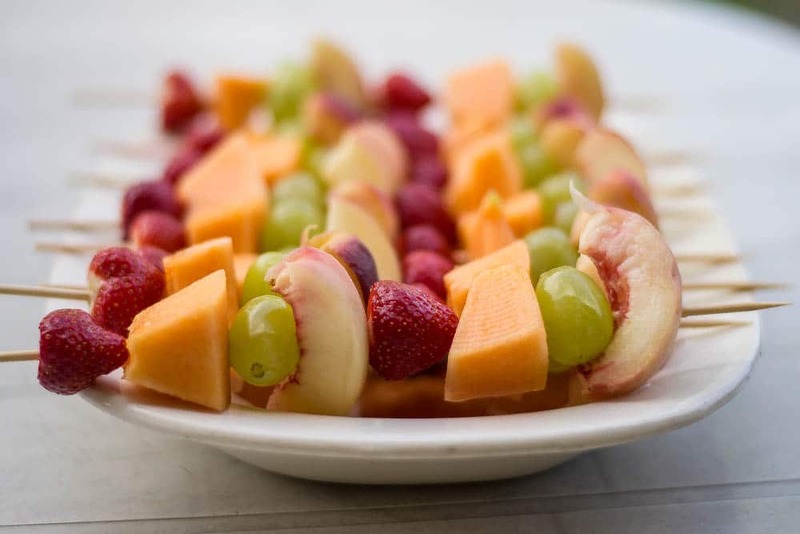 Start creating your kebabs by piercing a piece of fruit at a time in the skewer. Melt your chocolate in bain marie or in the microwave for two minutes. Place the kebabs on a baking paper in a tray that will fit in your fridge and pour the melted chocolate on top of them creating zig-zags or clots or whatever your fantasy inspires you. Quickly sprinkle the hazelnut pieces on the chocolate before it starts to set. Place the kebabs in the fridge. 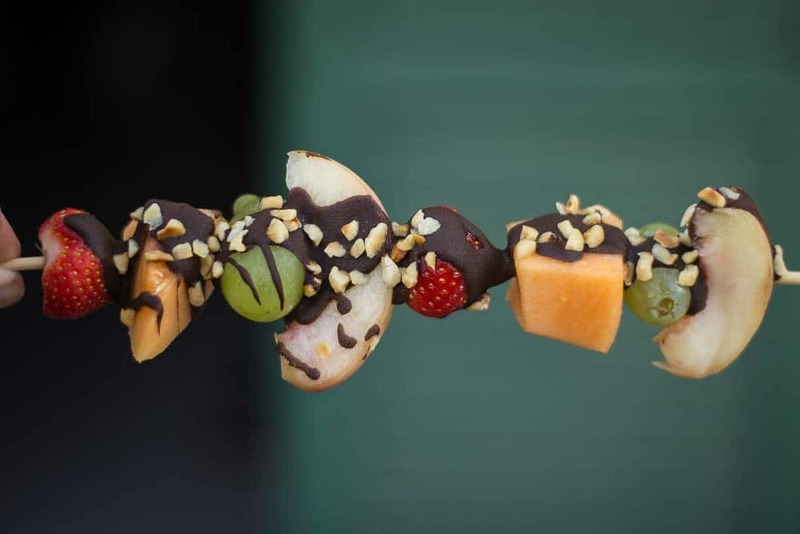 Once the chocolate is hard (it won’t take long), your hazelnut and dark chocolate fruit kebabs will be ready to enjoy!